Take advantage of this rare opportunity to make these heirloom lampshades, which are certain to increase in value as the years go by. We studied the photographs in Dr. Egon Neustsdt's book The Lamps of Tiffany, using a magnifying projector to assure that the patterns are accurate in every detail. 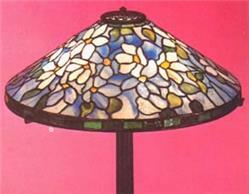 These lamp shades are among the all-time favorites of Tiffany collectors. 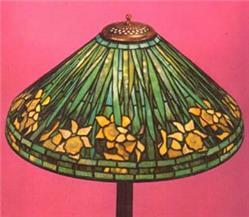 One version of this shade may be seen on page 82 of Dr. Egon Neustadts's book "The Lamps of Tiffany". This design is called "Belted Dogwood" because of the floral belt which surrounds the shade. Realistic large-lobed geranium leaves make up most of the main body of the 18" cone. The clearly definable older leaves, heavily mottled in yellowish-gold fill the bottom half of the shade, with the newer leaves, bluish-green in tint appearing toward the top. The scarlet or pink blossoms make a startling contrast to the leaves. The background is a sunny aura suggesting a bright summer's day. This 18-inch-diameter shade is smaller version of our #2294 Daffodil, which itself is based on the Tiffany pictured here (to the left). That 22-inch-diameter shade is intended for use as a hanging shade because of its size. This one should be used on a lamp base. 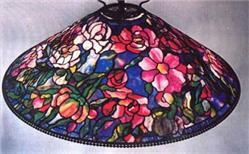 The Flowering Water Lily, because of its depth of color, brilliance of design and relative rarity is regarded as one of the most impressive of all Tiffany lamp shades. Our pattern is adapted from plate #154 in Dr. Egon Neustadt's classic book "The Lamps of Tiffany", published in 1970, shown in the photograph. Our lamp form has no returning lower apron. One may be added later after the shade has been removed from the form. It is worthy of note that there are no pattern repeats on this Clematis shade. Instead of duplicating a design several times, the artist skillfully evolved one single comprehensive pattern. Painstakingly recreated based on the photographs of Tiffany lamps found in Dr. Egon Neustadt's acclaimed book "The Lamps of Tiffany". We developed this project by studying the Tiffany Studios Grape Trellis Shade shown in eight-color process photography on page #254 of the book "The Lamps of Tiffany" by Dr. Egon Neustadt. The lampshade that was built from this set of drawings and instructions in 1973 is displayed in our building at the present time. It is 26 inches in diameter, utilizes plating, consists of more than 900 pieces of glass and took a craftsman more than 140 hours to build. Take advantage of this rare opportunity to make these three heirloom lamp shades which are certain to increase in value as the years go by. We studied the photographs in Dr. Egon Neustsdt's book The Lamps of Tiffany, using a magnifying projector to assure that the patterns are accurate in every detail. 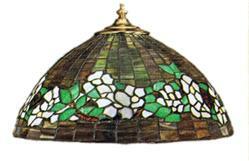 These lamp shades are among the all-time favorites of Tiffany collectors.